The Giants got up 7-0 in the first quarter, and just kinda sat on the Lions from there. 17-6 Giants. What was really impressive about this NYG win is – Matt Stafford looked fine. His finger was not an issue. Top corner Janoris Jenkins went down early in the game after an inadvertent knee to the back from a teammate. All that, and the Lions did not score a TD in the game against the NYG defense missing Jason Pierre-Paul, and then Janoris Jenkins. How good is this defense of late? How rich is D-C Steve Spagnuolo going to be in the offseason? The Giants can still win the NFC East and be the #1 seed in the NFC, but they’d need Dallas to lose to Detroit this week…and then to Philly. Not going to happen. Playing on TNF this week, NYG will be motivated to at least put the pressure on Dallas by beating Philly Thursday. Detroit is in a very tough spot. They need a win the next two weeks to secure at least a wild card, but they play two of the hottest teams in the NFL – Dallas and Green Bay. It is very likely/probable that the Lions will lose their next two and finish 9-7 and out of the final wild card. However, if they beat Dallas this week – all hell breaks loose because then the Giants are in play to win the NFC East. Green Bay is under a ton of pressure to keep winning to try to sneak in one way or the other. — The Giants are a top 5 DST option for Week 16 because they face turnover-prone Carson Wentz. Janoris Jenkins playing and moving fine is a key here. Without Jenkins, the Giants DST is just a top 5 hopeful. With a 90%+ Jenkins, the Giants DST is a #1 overall hopeful for the week potential. We’ll update the projections before TNF kickoff after the inactives are announced. Jenkins affects Jordan Matthews projections as well. — Can you trust Matt Stafford (24-39 for 273 yards and 0 TD/1 INT) in Week 16? You know the guy who has just 4 TD/3 INT in the past 5 games? One of my tie-breaker items on a Stafford decision would be on what happens on Thursday night. Giants win and Dallas is all-in on Monday Night Football…and Stafford could have another 0-1 TD dud. Eagles upset on TNF and Dallas has the #1 seed and division title locked already…and then it’s Stafford in a must-win against a relaxed Dallas team indoors – you might like that one a lot more. 11.5 FF PPG (18.3 PPR) on 6.8 rec. (10.3 targets) for 100.5 yards and 0.25 TDs per game over the four games for Tate. 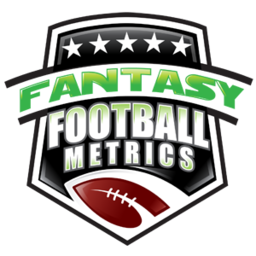 If I take out recent shutdown games versus Tate by Jalen Ramsey and Xavier Rhodes, he is averaging 7.7 catches per game since Week 6. — Four straight games for Eli Manning (20-28 for 201 yards, 2 TD/0 INT) with 201 yards or fewer passing in a game. Less than 260 yards passing in eight straight games. Under 210 yards passing in six of his last 10 games. However, 17 TD passes in his last 6 games – 2.83 TD passes per game. Pick your poison. Do you want low yards and a shot at 2+ TDs, then roll with Eli this week? Philly has been up and down tough/easy to throw on. Hard to tell which Eagles defense shows up tonight. — I don’t buy the Paul Perkins (11-56-0, 1 target) rumors wafting from NYG beat reporters…that he might be ‘the guy’ down the stretch. Rashad Jennings (18-38-0) has been bad for I don’t know how long, and just look at this game…18-11 carries in favor of Jennings – the trusted one by the NYG staff. — I want to love Dwayne Washington (14-31-0, 2-9-0/4 targets), but he’s giving me nothing. He started this game with a sweet 12-yard run, and I’m like “Here we go!” And then 19 yards on 13 carries the rest of the game. There is nowhere for him to run. I see bad blocking. I also see Washington missing opportunity to push to the outside…he’s one-note focused on trying to blast up the middle. Whatever it is, he’s not trustable for fantasy right now. I’ll be doing a ‘Rewind’ report on him quickly into 2017, I’m sure. — DeAndre Levy (8 tackles) played just 47% of the defensive snaps and made 8 tackles. I’d say he’s back and ready to go, no? Enough bringing him along slowly! — Sterling Shepard (4-56-1/5 targets) has 5 TDs in his last 7 games and 4 or more catches in six of his last 9 games. He’s a solid play for those that are needy.